With so many mysterious and sacred places in Mexico it is difficult to pin point one as being more special than the others. But the ancient cliffside Mayan site of Tulum on the Caribbean coast in Quintana Roo stands above most as being unique and awe-inspiring, and any trip you have planed across the border this year should include the time to explore this majestic example of ancient history and myth. Like everything else in Mexico, recent years of development and increased tourism interest have changed Tulum dramatically. Once (and not so long ago) a little out-of-the-way ruin site you might discover by accident, Tulum is now on the map as one of the more popular sites to visit on the Yucatan as tour buses line up daily to shuffle in and out the thousands of tourists that throng there from nearby resorts. 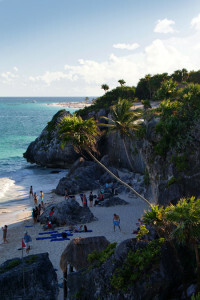 Yet, in spite of progress and popularity, ancient Tulum is a landmark that defies time. It doesn’t take a good imagination to stand on the cliffs with the ruins at your back and gaze into the Caribbean sea as did the lost inhabitants of this sacred site so many years ago. Forty feet below you are the white beaches made famous by postcards, and if you look hard and long enough, you can almost see the sails of the first Spanish ships that brought European explorers to the New World. 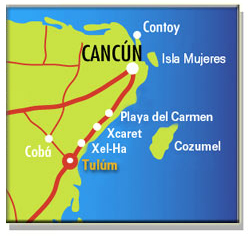 Tulum is located about 80 miles south of Cancun, smack in the middle of an area destined for high-dollar tourist development. Multimillion dollar resorts and spas, themed water parks, eco-parks, extreme housing developments for the rich and famous – these are just some of the changes that have already taken place in this most special place of the modern world. And many more are already under planning or development. But a trip into the region of Tulum can still be a real great adventure. True, gone are the 10-cent taco stands and $5 a night beach cabanas, but what makes the region, and especially Tulum, so special is a sense of the ancient history you get when exploring the jungle, the ruin sites, and the coastline of this remarkable destination. The city was first mentioned by Spanish explorer Juan Diez, part of Juan de Grijalva’s expedition of 1518, not long after Columbus discovered the West Indies. The first detailed description of the ruins was published by John Lloyd Stephens and Frederick Catherwood in 1843 in their popular book, “Incidents of Travel in Yucatan”. Early explorers must have been amazed by the sight of this great walled city with its buildings painted red, blue and white and with a fire on top of the main temple. While an inscription dated A.D. 564 has been found at the site, most of the structures now visible were built in the Post-Classic Era, between about 1200 and 1450. The city remained occupied through the early years of the Spanish conquest of Yucatán, but was abandoned by the end of the 16th century. 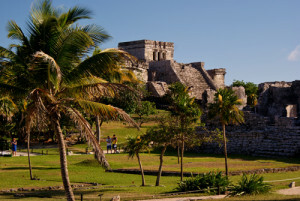 Tulum was one of few walled cities in the Mayan world. There is still some argument about why the Maya required a wall around the city (three sides actually, as the cliff facing to the east served as ample protection from the sea). Some archeologists argue the inhabitants of Tulum may have been in serious conflict with other Mayan city-states to the south in Belize. A few suggest the city was located on it’s beachfront perch to watch the Mayan trade routes that traveled up from the south and around the northern tip of the Yucatan on their way to gulf trading ports near Mayapan. There are also those that believe Tulum may have been a scacred spiritual center, a place where the rising sun could be worshipped each day and where sacrifices could be made without the oppression of the hot, low jungles that populate the Yucatan. The site may have been formerly also known as Zama, meaning the City of Dawn, or the “place where morning is born”. Tulúm is also the Yucatec Mayan word for fence or wall. From the numerous depictions in murals and other works around the site, Tulum appears to have been an important site for the worship of the Diving or Descending God. During the classic period of the lowland Maya, Tulum was connected to other major Mayan sites at Coba and Chichen Itza by rough but well engineered “highways” made of stone, indicating there was a great deal of traffic between the sites. 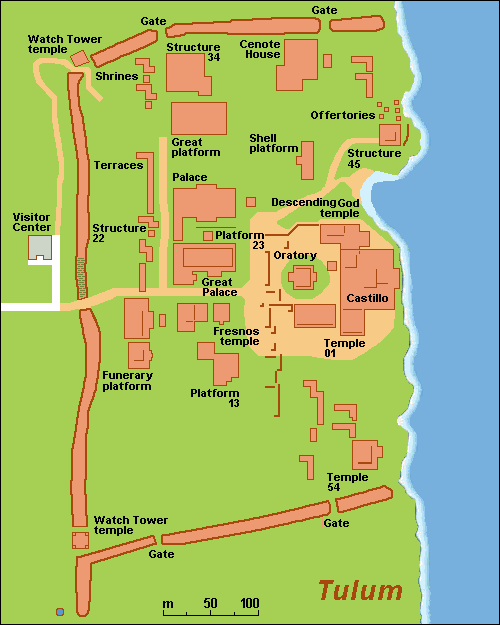 While Chichen Itza may have served as the dense population center for the Yucatec Maya and Coba may have been a smaller garrison and trading center, some would argue that Tulum – much smaller and compact that the other sites – may have been the spiritual seat of the region and a place where multitudes would gather for special annual observances. But Tulum was undoubtably an important trading post for the Mayans as well. From its beaches merchants could come ashore with their long canoes and shelter from adverse sea conditions. The highest building, El Castillo, was also a lighthouse to make navigation easier for these ancient mariners. When two torches were aligned, it showed the way through the surrounding reef. Artifacts uncovered at the site indicate Tulum may have traded with other Maya sites as far away as Guatemala and modern day Honduras. 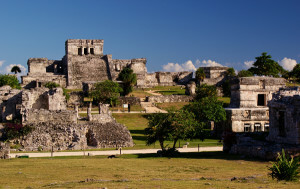 There are about 60 well preserved buildings on the site of Tulum today. The most significant of these have plaques with information in English, Spanish and Mayan. 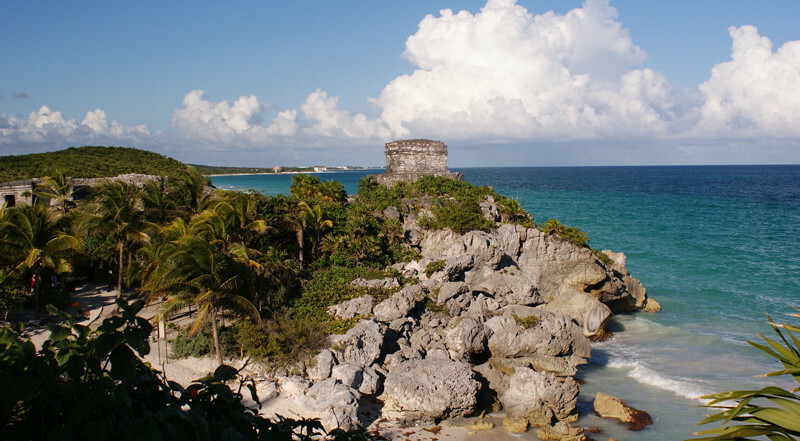 The most notable pyramid at Tulum is El Castillo, or the Castle. Now roped off to preserve the structure from abuse, not many years ago the public was allowed to scurry the steps to the top for a grand vista of the open Caribbean. On a clear day you could easily spot the island of Cozumel a few miles offshore. The doorway to the temple has columns in the shape of rattlesnakes, with the tails supporting the roof and their heads adjoining the floor. This structure, built in stages like most Mayan temples, is considered the one of the most important structures at the ruin site. In addition to serving as a lighthouse and watchtower to the sea, the building may have been used to offer up sacrifices to the rising sun. Another structure of note is the Temple of the Frescoes. Here you can still see frescoes with typical Mayan motifs in the interior. Some of the original colors are fairly well preserved. Around the outside of the building you’ll find many statues, also with traces of original paint. Carvings are numerous across the exterior of the Temple, including the image you’ll see throughout the ruin site, one of the diving god. With his wings and his bird’s tail, he’s thought to be a symbol of Kukulkan, the feathered serpent god that ruled the ancient Mayan world. Another and less popular theory about Tulum is that the Maya believed their serpent god, Kulkulkan, will one day return from the east to mark the beginning of a new and prosperous era for the Maya. Tulum is located as far east on the Yucatan mainland as is possible and would, indeed, be a great place to watch for this royal return. Its lofty placement makes the views some of the best in the Mayan world. In spite of the many hawkers peddling curios and souvenirs near the entrance of the ruin site and the large parking lot full or rental cars and tour buses, Tulum still offers that spine-tingling feeling of ‘old and rare’ and is well worth a visit. If you’re a lover of historic adventures you won’t stop with a simple visit here though. There are plenty more and less developed Maya ruin sites cattered all across the region and it doesn’t take much asking before you are directed to some of the best. Also take the time to snorkel or dive one of many crystal clear cenotes, or underwater caves, that dot the region. Side excursions should also include time at the beach and perhaps a quick trip to the islands of Cozumel, Isla Mujeres and Contoy. If you’re looking for nightlife, Cancun and the many resorts along the Mexican Riviera offer plenty of chances to party. But don’t leave the region withouit discovering the ancient secrets of the Mayan world. Logan Hawkes is an award-winning writer, researcher, publisher, broadcaster and adventurer., and managing editor-partner of Lost Planet Media, an online and print magazine publishing company. He has served as a guest and contributor to the History Channel, hosted the syndicated radio talk show, “Travel Quest”, and is the author of various history-based books, stories and docudramas that provide insight into history’s greatest mysteries. Read more at http://mexicolesstraveled.com/. Examples of Roger’s photographic skills can be seen in this article, as well as our current home page panorama. Roger lives in Ajijic with his wife Julie and son Aiden. To view more of Roger’s photo gallery, go to his photographic blog site at http://www.rsimerly.com/. ← Q. Buy or rent first?